May is National BBQ month- the perfect excuse to keep the kitchen cool and clean, and head out back to the grill. Busting out the Q doesn’t always have to mean indulgent food fests at family reunions or care-free cottage parties. But rather, by simply swapping the high fat processed or frozen meats for more wholesome healthful choices, we can enjoy that delicious smoky flavour every night of the week. So this month, forget about buying wieners to try to feed a crowd on the cheap- you can save calories and cash by grilling up a lean, organic whole chicken from Yorkshire Valley Farms instead! Last month, we discussed all the versatility you have when buying a whole chicken and breaking it down yourself, as well as some great tips for each of the different chicken parts. Now let’s explore the culinary possibilities for buying whole that don’t involve breaking out a boning knife or heating up the house. 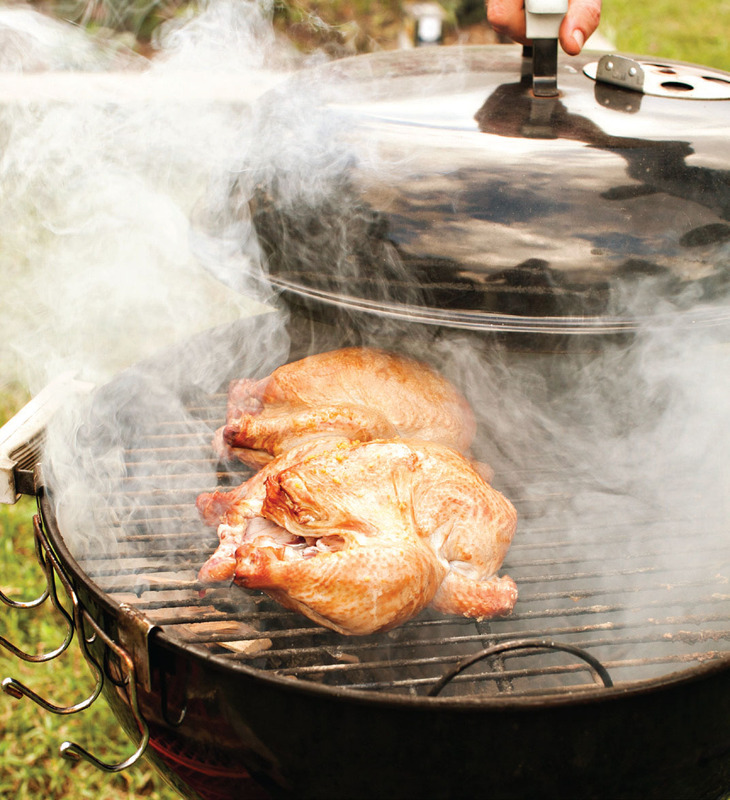 To help calm your fears about grilling a whole bird, we did some serious research using culinary BBQ and seafood expert, Barton Seaver’s latest cookbook, Where There’s Smoke. “There is no better way to arouse this hunger for communion of people than with that first fragrant whiff of smoke. 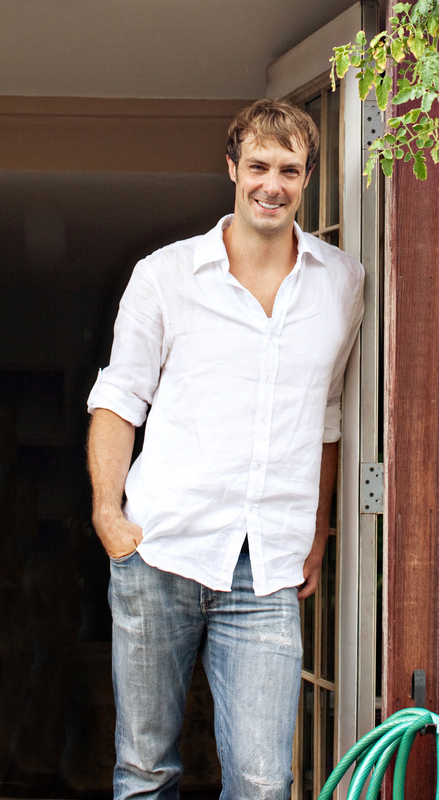 Grilling is inherently seasonal, celebratory and social,” says Seaver. Always cook or freeze a whole chicken before the Best Before date on the label. Unlike frozen chicken parts, which should be consumed within 4- 6 months, a whole chicken can stay safely in the freezer for up to a year. Just make sure to defrost it slowly in the refrigerator over night, and then use it within a few days. There’s no denying that one of the best ways to obtain moist, flavourful meat is to invite butter or oil to the party. Massaging the bird on the outside and under the skin will baste the meat in succulent juices and excellent flavour. For those watching calories, simply remove the crispy skin after cooking so you still can retain moisture without an excess of fat. Rubs can take on any flavour profile, but generally include salt, pepper, and whatever herbs, spices or sugars you crave. You can also opt to slather your meat in a sweet or smoky BBQ sauce- just be sure to add it in the last ½ hour or so of cooking, or else the sugars will blacken and burn. To add both flavour and moisture, throw some sliced apples, carrots, onions, garlic or citrus into the chicken cavity. Don’t forget to discard of those innards once the chicken is cooked as they may not be safe to eat! 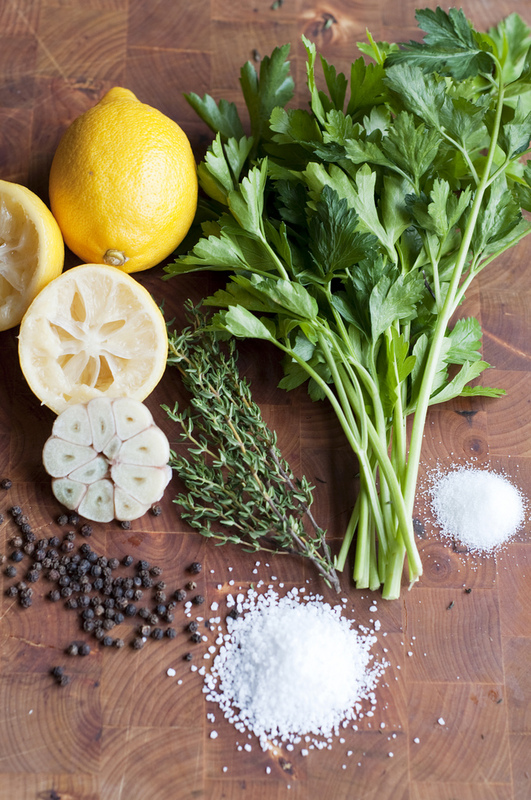 Brines are simply salt and water plus the aromatics of your choice such as citrus zest, wine, garlic, onions, sugar, herbs or spices. Seaver suggests that brining is particularly useful for low-fat free-range poultry like YVF since their lean muscles contain less water than their factory-farmed fatter cousins. Thankfully, brining for just12- 24 hours for chicken, and 24-36 hours for turkey can make all the juicy difference in the world. Barton Seaver has a great recipe in his cookbook. Marinades, in contrast, are a mixture of acid (vinegar, wine, citrus), and a base (oil, yogurt, honey), in addition to all those add-ins we mentioned in brines. Marinades are stronger, so they need less time to develop, and shouldn’t be continued longer than overnight. Place your meat on top of a roasting rack within a roasting pan. Preheat your grill to high, turn off one of the burners, and then place your pan on the side without the heat on. Then cover, and cook like a convection oven until done! Ask your butcher to remove the back-bone, so you can lay your chicken down flat on the grill. You also have the choice to use the “brick” method with a spatchcocked bird by weighing the chicken down with a heavy object like a brick or cast-iron pan until the skin is super crispy. Sure, it’s another gadget, but using a rotisserie is a great way to ensure even, slow cooking. It’s also a very healthy way to cook because it allows any excess fat to drip away. You may be familiar with “beer can chicken”, a vertical roasting method that imparts moisture and flavour into the poultry. Just take a swig of your favourite brew, pop the chicken cavity onto the can, and grill covered until cooked through. Still not sure where to start? Well, that’s what great recipes are for! Check out Barton Seaver’s Grilled Whole Roasted Chicken from his new cookbook, Where There’s Smoke. 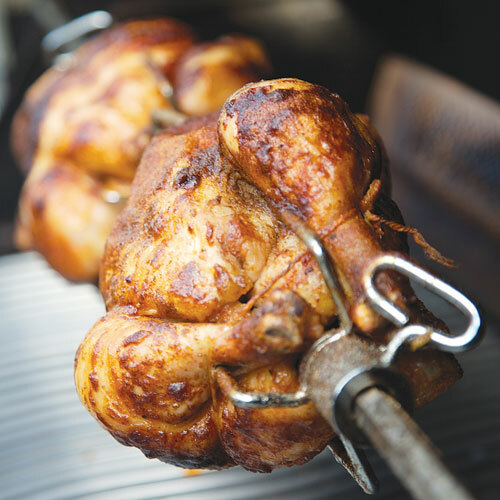 Pick up a Yorkshire Valley Farms whole organic chicken, and fire up that grill! Smaller birds are easier to manage on the grill in terms of ensuring doneness, plus I like serving a half bird to each guest. The brine is an important component of this recipe and replaces the need to season the birds before cooking. Drizzling the chickens with lemon-infused oil for the last few minutes of cooking adds an incredible scent that really enlivens the meat. The choice of wood for this is key, as too strong a flavor will mask the delicate nature of a pasture-raised bird. Will it taste good if heavily smoked with mesquite or hickory? Sure it will. But it won’t taste much like chicken. I have recently come to really appreciate the smoky flavor citrus wood generates. Another delicious option is to make a wood fire of oak or maple, in which the wood is providing more heat than aromatic smoke, then add dried fennel stalks above the grate so that they smolder alongside the chicken. Or add the dried stalks of end-of-the-season basil plants. Place the chickens in a large bowl or pot and pour in the brine. Cover and refrigerate for 12 to 24 hours. Drain the brine. Place the chickens on a baking sheet and dry them with a desk fan for an hour to form a tacky layer on the skin surface; this is called a pellicle, and it’s what the smoke flavour will stick to. You can also dry them overnight, uncovered, in the refrigerator. Build a large fire in the grill. When it has died down to embers, add the flavouring wood chips or stalks. Place the chickens on the grill away from the coals, with the legs closer to the fire. Cover the grill and choke the airflow to a sliver. Cook for 30 minutes, adding more wood chips if necessary to keep a billowing smoke going. Check the birds with an instant-read thermometer inserted into the leg against the bone. It should register between 135 and 140 degrees F. Rotate the birds so that the breasts are closest to the fire. Cover the grill and cook for another 10 minutes. Uncover the grill and drizzle the birds with 1 tablespoon of the olive oil, then cover and cook until the thermometer registers 160 degrees F, about another 5 minutes. Remove the birds from the grill and let them rest for 15 minutes. Section the birds into legs and breasts and drizzle them with the remaining 2 tablespoons olive oil. Serve immediately.